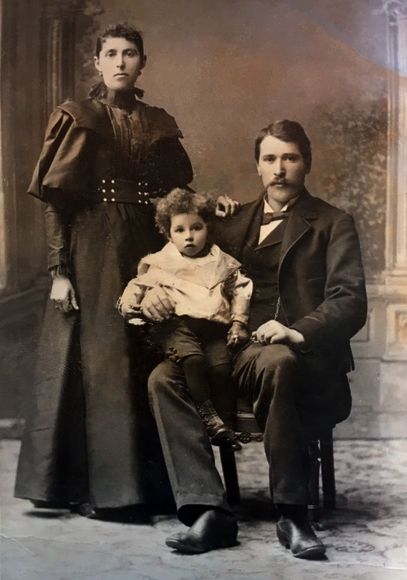 Raffaele and Lucia Genetti with their first child, Alessandro. 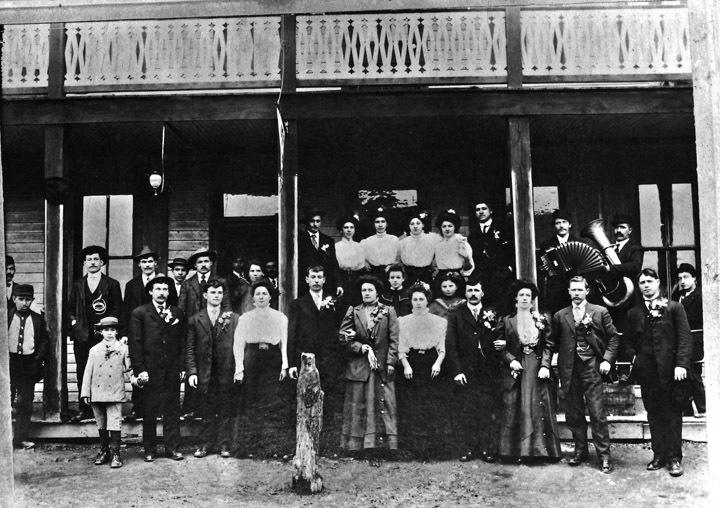 Photographed about 1897, Pennsylvania. This is my recollection, particularly of my Nono who influenced my life by my interaction with his life. You probably all have heard the saying, “What you do speaks so loudly, I don’t hear a word you are saying!” This was so true of Nono. I was born when they were in their 60’s. We lived just one house from them. Nono was my pal, my teacher, my mentor. He was tall, 6′ 2″ when standing on his good leg. The story I remember being told as a child, was that Nono was jumping logs as a child of about six years old. He fell and fractured his hip, and it wasn’t set properly. The accident left his left leg about four inches shorter than his right leg. As a result, he had to wear lifts on his shoe and couldn’t bend his hip. But it didn’t prevent him from living a full life. He would get up early, hitch up the horse and wagon, and go to the four-acre farm which was on the hillside about a quarter of a mile from the house and barn. He would come home, have lunch and rest – either in the day bed in the kitchen or the glider on the back porch. Front: Raffaele, Anna, Lucia. Standing: Albert, Mary, Silvester, Leona, Elizabeth. Around 4 o’clock he would go back to the farm again. After supper, he would sit in his chair in the parlor, (cushions arranged so that he was comfortable) and listen to the radio, read the newspaper, etc. The rest of the day, he would feed and care for the chickens which he raised, the horse, and do any repairs or other chores. He had a large area in the chicken part of the barn that was screened off where he kept his tools. They were always cared for and in order. The one machine I remember, separated the corn from the cob. Put the corn in the top, turn the wheel, and the corn came out the chute. One turned the wheel by hand, of course. I loved doing it, that and feeding the chickens, and picking the eggs. If the chicken was in the nest, you got accustomed to your hand getting pecked if you didn’t go under them properly. 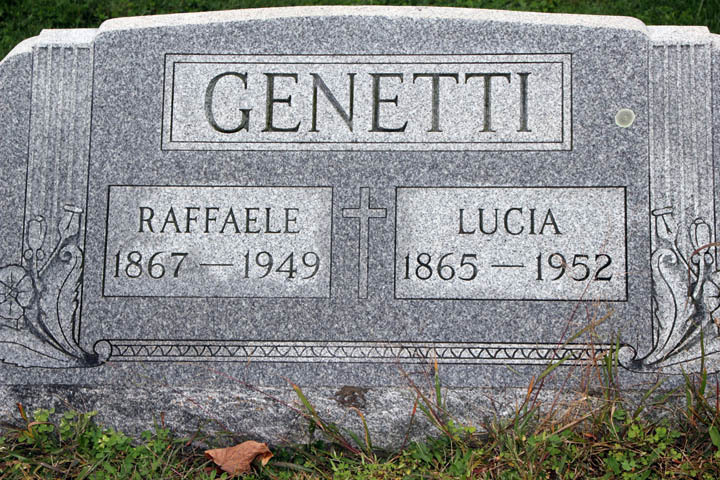 Family of Raffaele (1867 – 1949) and Lucia (1965 – 1952) Genetti. Photographed 1947 or 1949. Raffaele is standing in the middle, with Lucia seated. 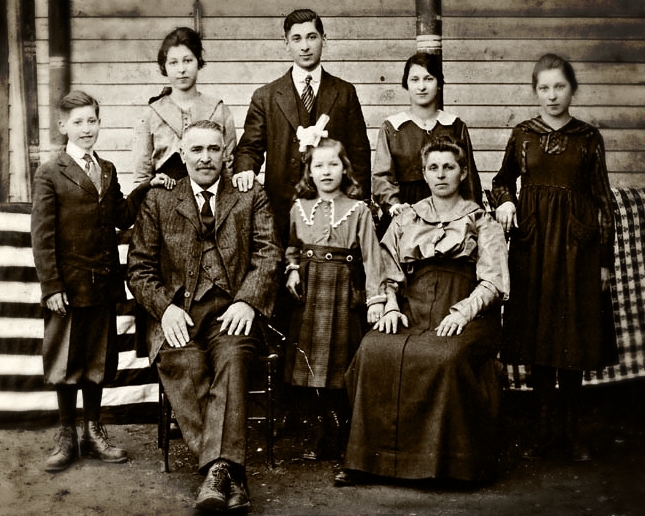 Their children from left to right: Elizabeth Genetti Smith (1904-1964), Mary Genetti Hudak (1901 – 1992), Silvio Genetti (1899 – 1982), Albert Genetti (1906 – 1990), Anna Genetti Nenstiel (1909 – 1974) and Leona Genetti Hayden (1903 – 1979). I have this streaming picture in my mind of my grandfather, sitting in one of the fenced-in areas, sitting behind a stone wheel, with a can hanging on top dripping water on the large stone wheel, sharpening his scythe, and hammering out the dents. Part of the large yard he would let the grass grow high, cut it and give it to the horse. I remember the rhythm in his using the scythe. Their place was a child’s dream. There was this rambling huge house, barn with a hayloft and two chicken coops. Before my time, Nono had a bar and dance hall. From what I was told, Nono was a good dancer. When Prohibition became the law in 1929, that stopped. The Hall was used at various times for gatherings, and storing the produce to be used as needed, but not in later years. We grandkids had a ball playing in the house. I think there were eleven bedrooms and no central heating. I remember Nono taking a brick which had been in the oven all day, wrapping it in a cloth and taking it upstairs to put under the bed. Evidently, it acted as a heater. There was a kitchen stove and a large coal-burning heater in the dining room called “A Bucket a Day” (that was the term used for the heater!). And that was all of the heat! But the stove and heater were pretty efficient. I can still visualize the coal bucket sitting next to the heater and I don’t ever remember being cold. But the delicious breads which came out of Nona’s oven – I can still taste them. 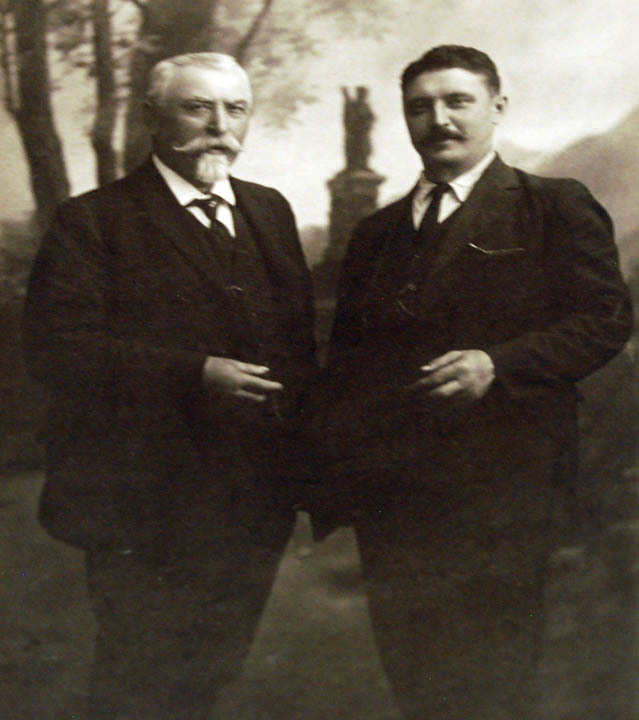 Brothers Daminao and Raffaele Genetti. Studio portrait probably photographed around 1922. Raffaele was about 55 years old at the time of this portrait. There were two doors into the long hallway which ran the length of the living room and dining room. In the hallway were the stairs, a door leading out into the front of the house which had a long porch, and a door leading into the bar. The bar was separated from the dancing hall – and there was another doorway between them. The rooms were large and there was a sun porch off of the living room. Another picture comes to mind: A few of us grandchildren, sitting around this large kitchen table trying to imitate Nono cutting an apple in two like a jigsaw puzzle. I never did get it right. In the summer I would go up to the farm with Nono in the afternoon. Before he was ready to go, he would be resting on the glider. He would let me pack his pipe, and it had to be packed right. Then I would light the pipe and impatiently wait until he was ready to go. Those times were important. He would tell me stories about growing up, family, and how he learned to speak the many languages he spoke. He had a rapt listener in me. When he rested in the kitchen he would chew tobacco – or rather, keep it in his cheek. He didn’t really chew it. 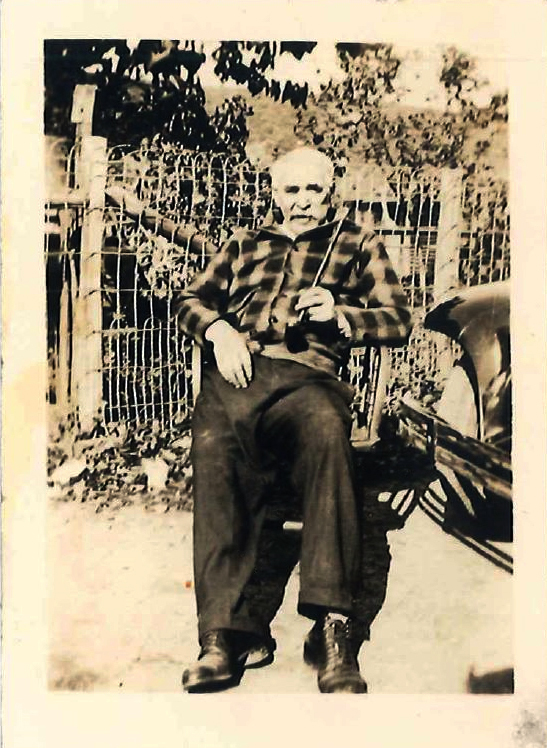 Raffaele Genetti (1867 – 1949) with his pipe, probably photographed mid-1940’s in Weston, Pennsylvania. He would let me help him hitch the horse to the wagon, and sometimes, hold the reins. All his horses were called “Sally”. I learned so much about crops and fruit trees and grape arbors. Of course, everything was organic. No pesticides, and there was manure for fertilizer. When we would weed around the corn, the weeds were left on the ground to rot back into the soil. I don’t remember Nono ever telling me, “Be careful, you might hurt yourself” or “You can’t do that. You’re too young or you’re too small.” An example: When the sour cherries were ripe, he encouraged me to climb the tree and “Eat a belly full! Climb higher! There’s more up there!” Whether it was showing me how to hold the apple in my hand to give to the horse or letting me on the harrow behind the horse while gathering the hay – calling out ‘dump’ when it was time to release the rake and down it went again, he never gave me a reason to lose my confidence. My Nona also loved planting. She had a huge area on the one side of the house for planting, used mostly for everyday food, herbs, etc. She took care of it by herself. 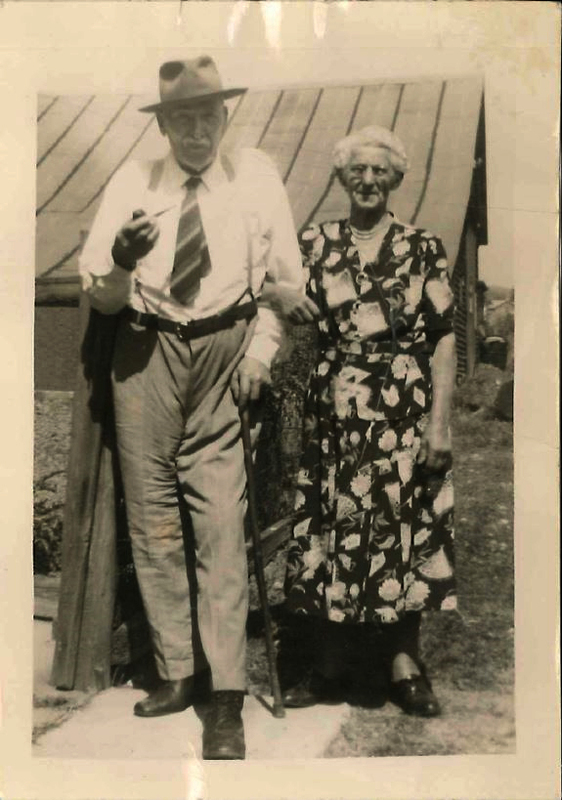 Raffaele Genetti and Lucia (Zambotti) Genetti – photograph of Nono and Nona. Probably photographed in the mid-1940’s. I don’t remember dates, just periods of time. Early in my life, my grandparents also had pigs and a cow along with the horse. I can remember the milk separator – separating the cream from the milk. I remember how once-in-awhile, Nona – who milked the cow, would put his tail on some kind of restrainer while she was milking. Sometimes she would forget to free the tail! Eventually it became too hard for Nona to do the milking, so no more cows. Every year a pig was killed. That day, the entire family came together to make sausage, brusti, scrapple, etc. Everyone had a task. My uncles would smoke the sausage and hang it until it was dry and ready to eat. Yummmm! I don’t remember anyone ever getting sick from eating it. Another time the entire family got together would be when the chicken corn was ready to be harvested. We all picked it, loaded the wagon, and had a ‘corn husking’ in the barn, tying bunches together and hanging them in the screened area where the chickens were kept. Of course, there were other times we were all together, but these two made a strong impression on me. Nona was very loving. She lived to be 87. The last years of her life, she developed Type II diabetes. 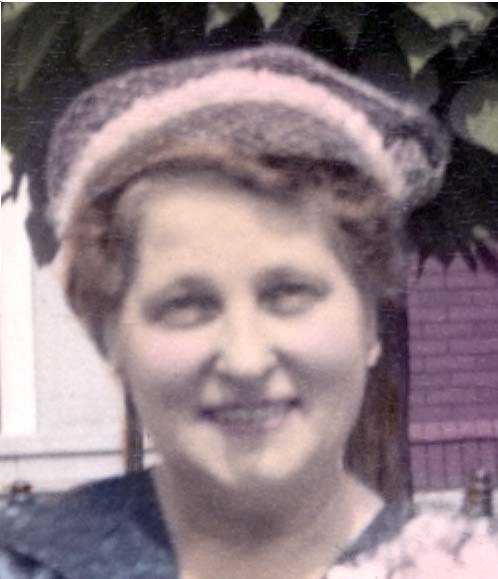 She would come to our home at 7:00 a.m. and my mother, Elizabeth, would give her a shot of insulin. My mother would also send me with a supper platter for her. The last two years she became a semi-invalid and lived with us. As much as Nono seemed to be quite content, looking back, I really believe Nona would have liked to visited others outside of Weston. One time I remember taking her to Hazleton to see Stanley Genetti. She could hardly wait to get out of the car and I know she enjoyed every minute of it. I would help her clean at times. She did not like needing help, and always tried to assure me that it wasn’t dirty. I can’t imagine how hard they must have worked when they were younger. Business, children, and I believe they had boarders. O, marusa pielpita la me la manno! About author: Helene Smith Prehatny is the daughter of Paul P. Smith and Elizabeth Genetti. She is the granddaughter of Raffaele Genetti and Lucia Zambotti. 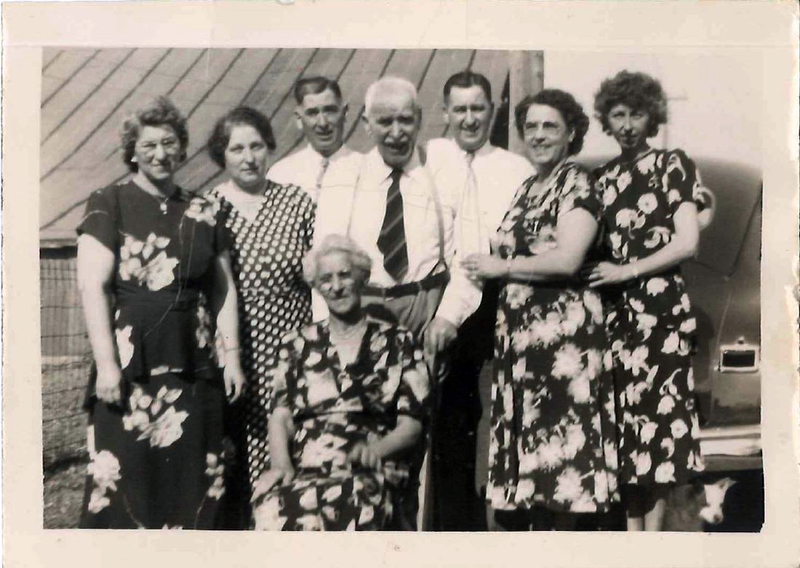 Helene has a large family, with many grandchildren and great-grandchildren. She lives in Philadelphia, PA.
To see more family photos from Helene, please go to the Photograph Page in the Gallery Section.